Sometimes on journey's one takes detours. We've learned on life's journeys there are often surprise detours - which we've come to call plot twists. We are not in Japan, we ARE making the most of travel and family time. This week we had a plot twist....Mom G's doc wanted to meet with family. We rearranged our Oregon/Texas travel plans and Michael and I made a quick detour to Crescent City. The kids stayed in Eugene and had a great time with their sisters. We had a wonderful visit - and Mom G encouraged us to take a walk. 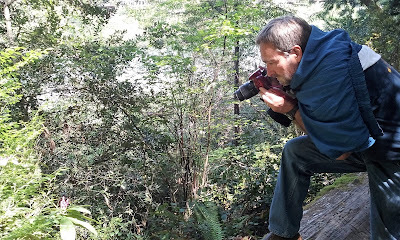 We walked down to Stout Grove in Jedediah Smith Redwood Park. Can you make out the cable in the right/top of photo? As we talked with each other and then with the doctor, we hit upon the idea it would be beneficial to Mom G if we take a detour from our traveling plans and spend time here with her. We will help to take care of her home, help her complete multitudes of unfinished "projects," and hope to set in place in-home help for her for when it is time for us to travel again. We were able to secure a spot in the nearest RV park (3 miles) through the rest of this year to be used as needed. Somehow, walking amongst these giant Redwoods helps to put life into perspective. Yes, we're a bit sad to curtail our exploration of new areas....but there are a lot of great things about being in the area with Mom G.
Stacia has been saying for months she wanted to spend her birthday with Grandma G as she hasn't done that before. We had summer employment plans which have made this impossible. She will get to spend her birthday with Grandma Mary.